The ratings for Castle were down last year but the show is still a very viable performer for ABC. Though the show’s demo numbers are just okay, Castle is the network’s most watched drama. Production on season six was recently shut down when series star Nathan Fillion didn’t show up for work. It seems the actor’s in the midst of a contract dispute with ABC Studios and wants a four-day work week. What do you think? 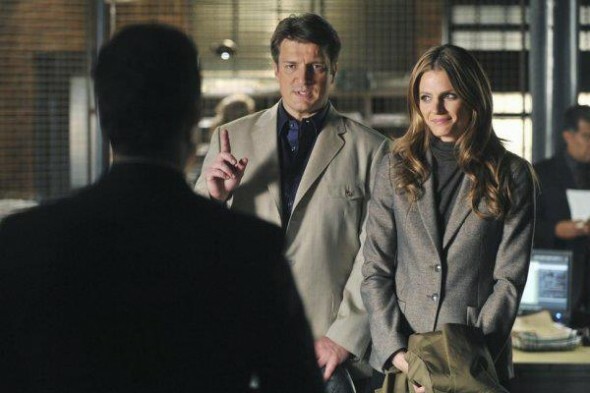 How long should Castle continue? Should this be the last year or should the series keep going after that? Is it still a compelling show to watch? Castle: Cancel or Renew for Season Nine? Don’t bother, the editors of this site select only favorable comments – wipe the rest. News releases display a total lack of understanding of the problem: They should have fired the story line group..They causes the problem with LocSet and all that nonsense – which drove the viewers away! And the “stupid” ABC execs let it happen while they drank their martinis.! Keep Castle going for many more seasons to come please! I love Castle! My husband and I watch it every week or record it. We enjoy the detectives working together with a romantic twist. The humor shown between the characters makes it funny but also it is a action series. Sorry when it goes off the air. Love everyone on the show. i love this show — it should definitely be renewed! I really love this show and did not know it was scheduled to be cancelled. If it is going to continue (which I hope is the case). On what date will the new season begin. I love this show. I did not know it was scheduled to be cancelled. If it is staying I was trying to find out what date the new season begins. I certainly hope you don’t cancel Castle. I absolutely love that show and it’s the only show my husband and I actually watch together. It’s funny and there’s lots of action and drama. It’s an all around great adult show. I can’t understand why a great show like Castle could be taken off and yet shows like the Simpson’s can stay on for years. That’s great for those who have the mind of a child, but what about us grownups? Love the show. The show offers all good ingredients: Action, drama, love story,… Hope it doesn’t get cancelled.